Since I’ve always been completely enamored with Red Velvet (red food coloring and all!! 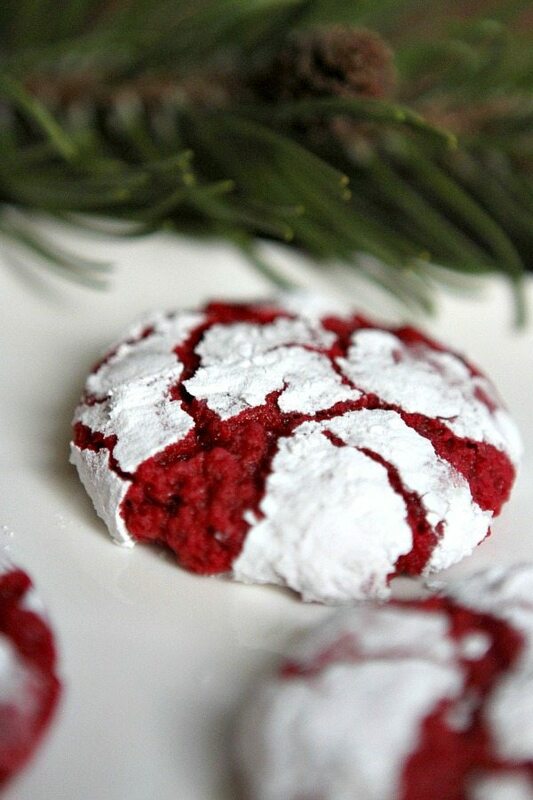 ), it seemed like the right thing to do to share a red velvet cookie recipe with you for this holiday season. These cookies are properly chewy and rich and wonderful. 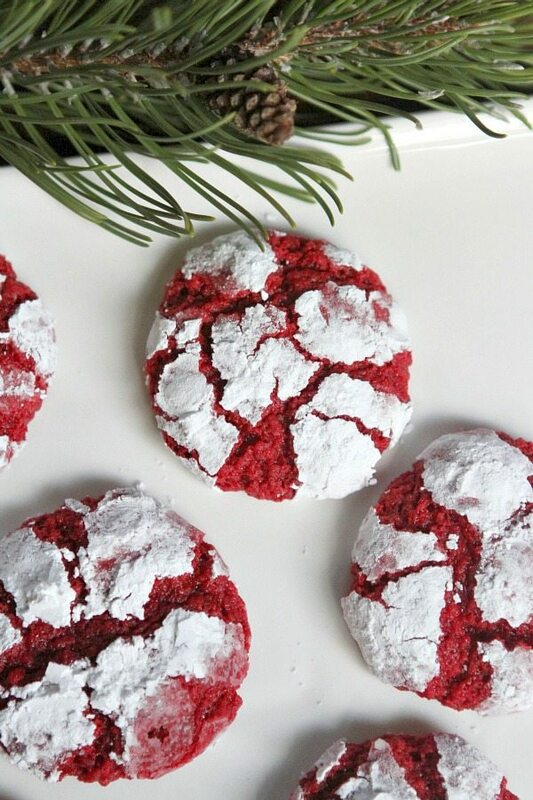 They’ll be perfect for holiday cookie platters or cookie exchanges. This recipe comes from a new book by Deborah Harroun: Red Velvet Lover’s Cookbook. First of all, Deborah is a good friend of mine who writes the blog Taste and Tell. 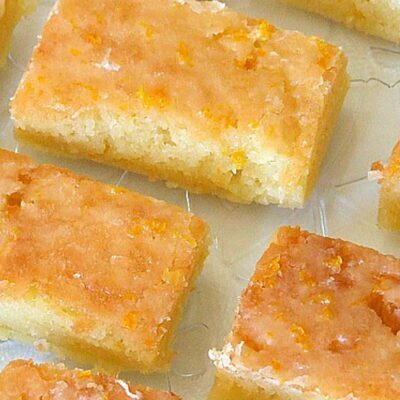 She shares so many awesome ideas for family-friendly recipes. She’s one of the most creative bloggers I know! And this is her first book- yippee! If you are a fan of the ever-popular red velvet cake (my absolute favorite), you’ll love to have this book and try out some of the other innovative ideas for incorporating the red velvet flavor! 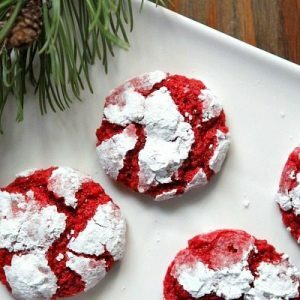 You’ll find recipes for things like Red Velvet Crepes, Red Velvet Waffles, Red Velvet Cheesecake, Red Velvet Gooey Butter Bars, Red Velvet Truffles and so much more. It’s a fun book to have in your cookbook collection, for sure! Aren’t they so completely festive? I love the crackle. I love the powdered sugar, snowy adornment. 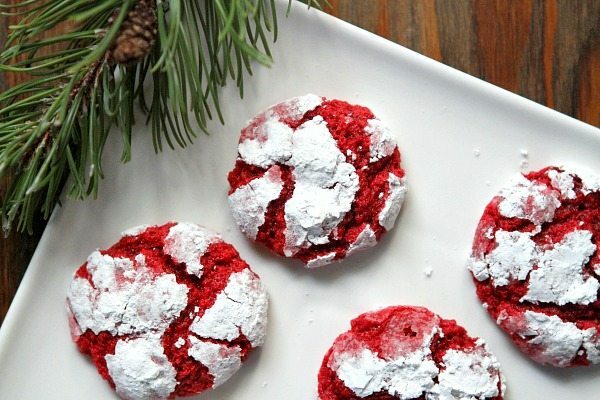 And I love the chewy, gooey, red velvet flavor of these cookies! 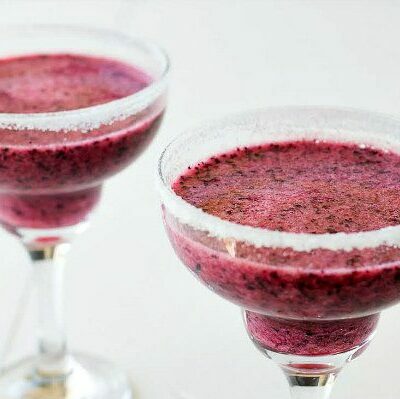 They are perfect for Christmas. You need a big, tall glass of extremely cold milk to go with your cookies, right? Of course you do! But sadly, not everyone has access to milk. Milk is one of the most requested items at food banks, yet it is rarely donated (isn’t that totally awful??) Of the 46 million Americans food banks serve, the average person gets less than 1 gallon of milk per year. This makes me so sad since kids need milk so much. My 13-year old son drinks a gallon within a couple of days. The entire dairy industry from dairy farmers to dairy processors has come together and joined with Feeding America food banks to help get milk to those who need it most. Visit www.santasmilkdrive.com to donate. Simply type in your zip code and the donation you make will be distributed to a food bank in your own area, so you know your good will is doing good in your very own community! 1. Whisk the flour, granulated sugar, cocoa, baking powder, and salt in a bowl to combine. 2. 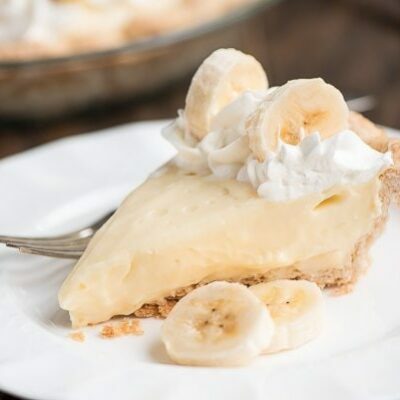 Beat the cream cheese and butter in a large bowl with an electric mixer until smooth. Beat in the egg and food coloring. 3. Add the dry ingredients to the creamed mixture and mix until the dough comes together. Cover with plastic wrap and chill the dough for at least 2 hours. 4. When ready to bake, preheat the oven to 350 degrees F. Line two baking sheets with parchment paper. Place the powdered sugar in a shallow bowl. 5. Roll the dough into balls (about 1 tablespoon each). Roll the dough balls in the powdered sugar, then place on the baking sheets at least 3 inches apart. Bake until the edges of the cookies are set, 10 to 12 minutes. Transfer the cookies to racks to cool completely. Store the cookies in an airtight container for up to 3 days. 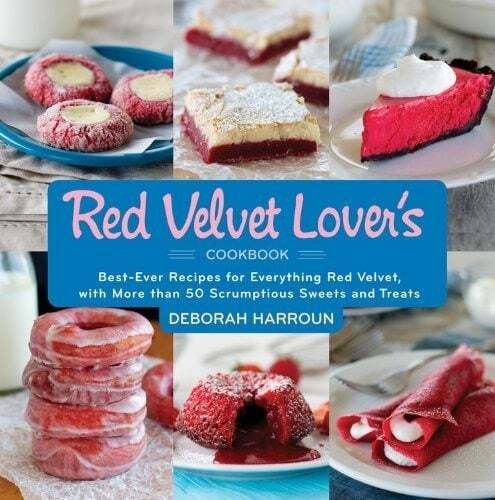 Disclosure: I received a copy of the Red Velvet Lover’s Cookbook for review. All opinions shared are my own. There are Amazon affiliate links included within this post. 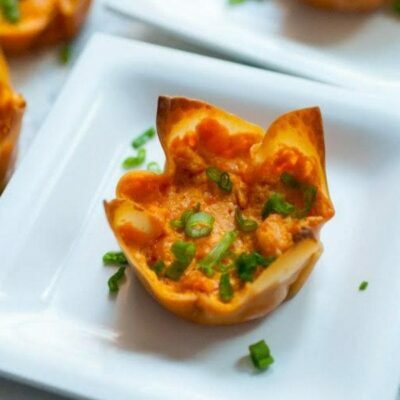 These looked so good so we made them for the holidays. I decided to disregard the negative comments left on the cookies and make them anyway after looking at the ingredients. They take two cups of sugar, so I figured what could go wrong/how could people be saying they aren’t sweet? Well, they weren’t very good at all. It’s true the powdered sugar makes them smoke in the oven.. they only cook for 12-15 and after leaving them even in a few minutes longer they seemed undercooked and tasted like a sweet play-doh. We made three batches of different cookies and these were the only ones that remained virtually untouched. No one liked them enough to have more than one (myself included). I would recommend you fix this recipe or take it down altogether. I’d hate to see anyone else as disappointed as my entire family was. These were a huge flop and a weird cookie that looks pretty but isn’t anything special. Followed the recipe exactly as stated and was very disappointed. I agree with some others. These cookies had no flavor at all. I think they may need some vanilla. We made these today for Santa. They came out amazing! I followed the recipe to a T. I will say I did the last batch with chocolate chips, and if you are looking for more sweetness, that’s the way to go. But they were perfect red velvety goodness as the recipe intended. I know I’m a few months late but I made these as a Valentine’s treat for my coworkers today. I followed the recipe exactly and they came out perfect!!! They looked and tasted delicious…..Thank You!!! My only regret is that I didn’t get any pictures before they were devoured.